So how can your business play a role in this space? Is your company’s marketing efforts, as they stand now, even relevant in the world of social media or does they need a change when it comes to getting the word out in this fast-paced, ever-changing online world? The fact is that most businesses can adapt their marketing efforts to become more inclusive of social media, and many are doing so today. On a recent trip to the Sonoma wine country of California, I found that many wineries, large and small, were progressively bringing social media marketing completely in-house, hiring a full-time social media marketer to keep their products relevant and out there in the social media world. They’ve already moved past the first phase of trying it out themselves, as a part-time “labor of love”. They’ve also moved past the second phase of hiring someone to set their social media marketing infrastructure up and get them active in the world of Facebook, blogs and Twitter. Since social media marketing is one part strategy and setup and nine parts labor, they recognized early on that once they were set up and proving that social media marketing worked, they were ready to take this on full-time with an ROI they no longer needed to hope or assume would come. The trick is in the initial strategy and setup. 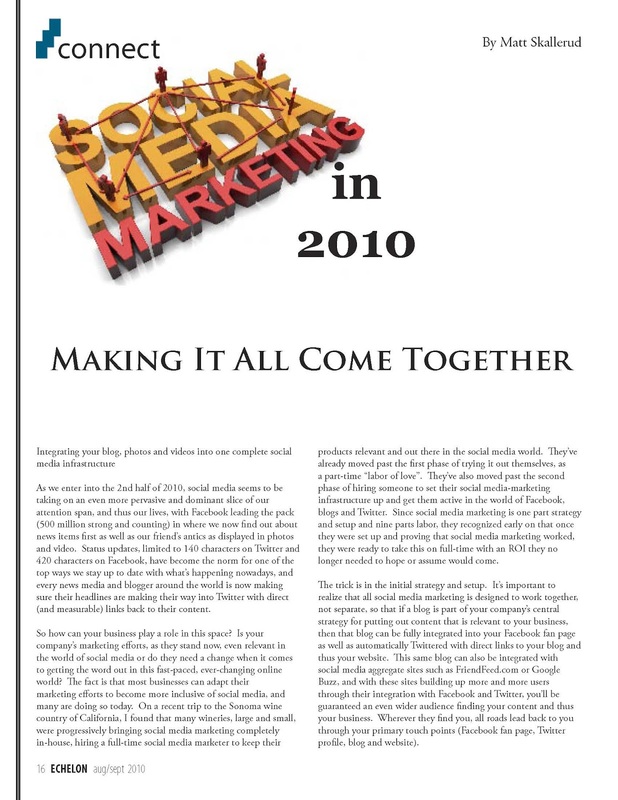 It’s important to realize that all social media marketing is designed to work together, not separate, so that if a blog is part of your company’s central strategy for putting out content that is relevant to your business, then that blog can be fully integrated into your Facebook fan page as well as automatically Twittered with direct links to your blog and thus your website. This same blog can also be integrated with social media aggregate sites such as FriendFeed.com or Google Buzz, and with these sites building up more and more users through their integration with Facebook and Twitter, you’ll be guaranteed an even wider audience finding your content and thus your business. Wherever they find you, all roads lead back to you through your primary touch points (Facebook fan page, Twitter profile, blog and website). The same applies for your photos and videos… using Flickr.com for photos and YouTube.com for videos, your content can be fully automated to propagate out there to where your audience and potential customers are. By setting up a simple infrastructure to handle your written word (blog) and photos, you’ll have 90% of your social media implementation in place. That leaves just 10% to the time needed to make sure you’ve approved all of your contacts and friends, added a few status updates, as well as reposted a few articles (with your own commentary) you found relevant to your business that your audience would like to know about from you (setting you up as a “thought leader” in your field). Using a site such as Delicious.com makes integrating and spreading these articles fully automated as well, just like when using Flickr.com and YouTube.com. And what’s on the horizon? Location-based social media integrating your web and smart phone experience are coming on strong. FourSquare.com and Gowalla.com are in the lead, but Google and Facebook want this market and are actively pursuing development in this area as well… it’s like Yelp or TripAdvisor on steroids, adding a more social element to businesses we frequent and allowing folks to keep it more positive with tips and advice rather than just reviews. Perfect for the worlds of local and destination marketing! And keep an eye out for websites such as IGLTA.org, which are integrating social media for their membership, allowing in this case GLBT-friendly travel-related businesses to get the word out not only to their friends, but now to their peers and consumers interested in GLBT travel as well. This will be the next wave of social media integration, pushing beyond your friends and reaching out to your company’s target market, both on a consumer and business-to-business level, further maximizing your social media marketing efforts for years to come. People find more thrill and fun from social networking sites.